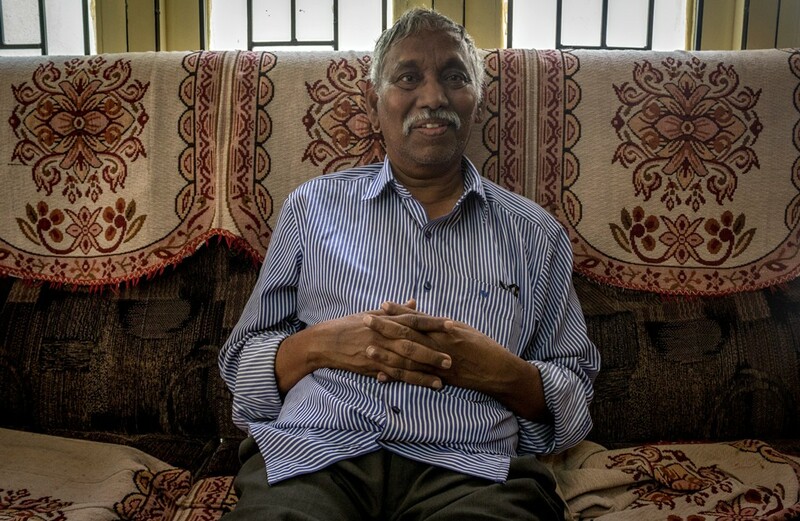 Aaraveeti Ramayogiah sits on a brown wooden sofa at his daughter’s home in Hyderabad, carefully slipping coherence into the words he speaks. 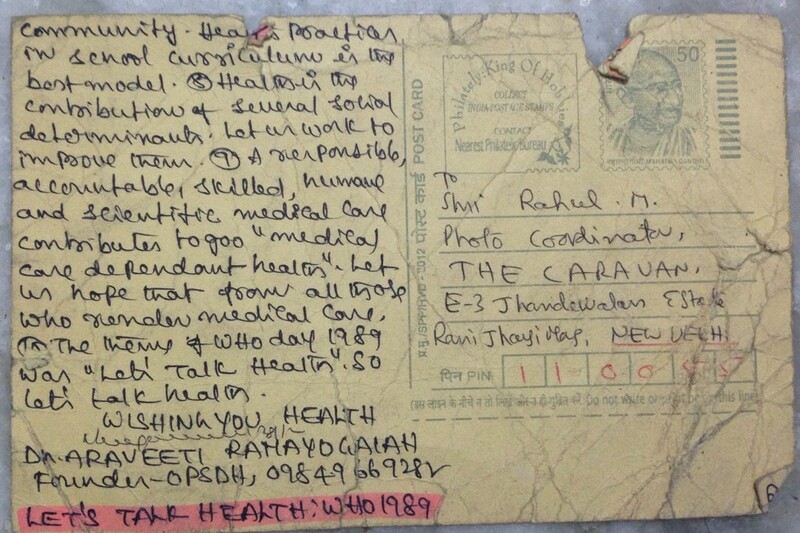 Ramayogiah, a sixty-five year old doctor with a thick white mustache and childlike glee in his face, has written over 27,000 postcards enumerating ways to prevent diseases to low-income people in India. Ramayogiah was forgetting things, and was trying his best to mask it. He would carefully avoid calling people by their names, and would start a conversation picking on the details his friends just dropped. He knew very well that his clock was ticking its last. “I have lived my 65 years happily, I am satisfied with that,” he turned to his daughter who was staring at him helplessly, ”I will file a case against you in the court. I have a right to choose what would be done to my body.” Ramayogiah’s family and friends have been persuading him to undergo a brain surgery that could extend his life a little longer than the multiplying tumor cells in his brain will allow. I met Ramayogiah in my hometown, Anantapur, earlier this year before he was diagnosed with brain cancer. I was dropping him on a bike to the house of a relative and was hoping to interview him for a story. “I am tired after all these years. Now I would like to relax, travel around and to educate people about health.” He seemed disappointed that not many people have noticed and supported his ideas. “Eighty percent of diseases in India are waterborne and airborne, and can be easily prevented.” Ramayogiah told me, “all that one needs to do is have clean surroundings and drink boiled water.” Ramayogiah wanted to spread this message to as many people as he could. His favorite medium to do this was postcards. 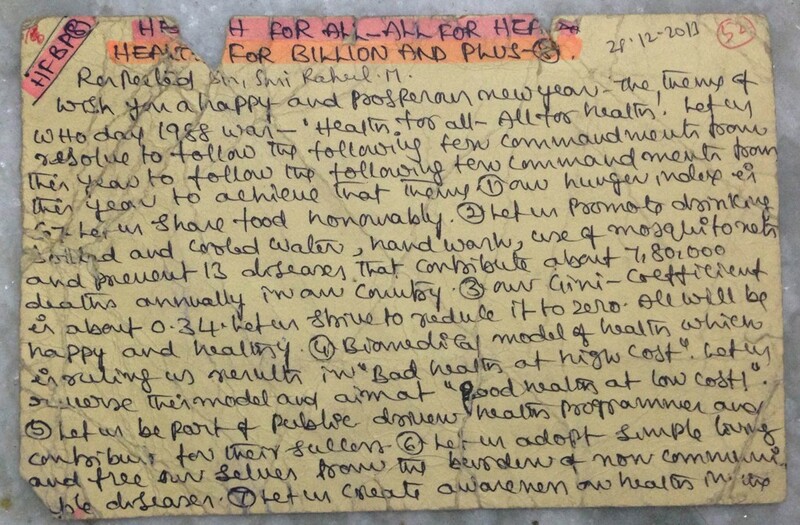 In 2014, before I met Ramayogiah, I arrived at my office in Delhi to see a yellow postcard neatly handwritten in English on both sides on my desk. Ramayogiah learnt from my father that I was interested in his work. He immediately sent me a postcard listing ways to prevent several diseases. I was pleasantly surprised. Over the years, Ramayogiah has noted down addresses of people he would meet on the street, his acquaintances and patients. “I would go back home and write their addresses in a register.” Ramayogiah told me. He used the postcards to talk about several health issues. During the early 1990s, he would write postcards about the importance of breastfeeding. He would make sure that the letters are addressed from the hospitals worked at. “That way when women receive these postcards they would take them seriously as they look official.” Ramayogiah told me. Around the same time, a hospital he worked at in Chittoor was declared as the first baby-friendly hospital in india due to his efforts. Editor’s note: Aaraveeti Ramayogiah passed away on September 6th, 2015. Rahul M is an independent journalist based out of India.